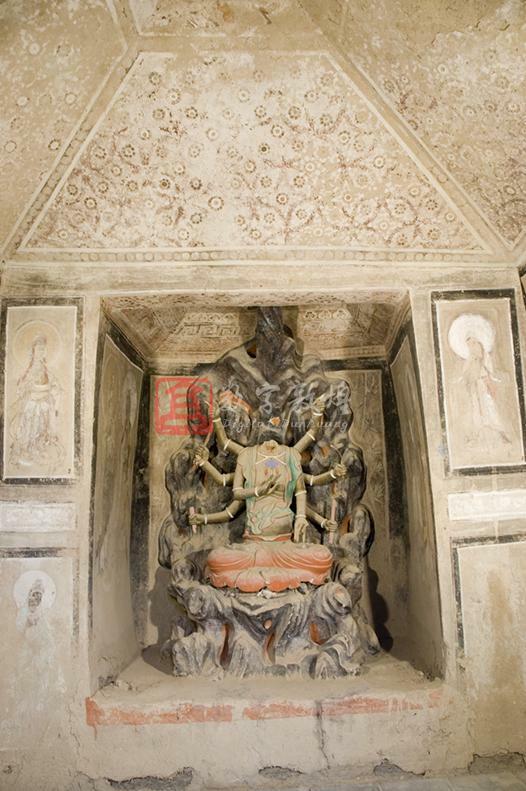 Constructed in the Yuan dynasty (A.D.1279-1368), this is a small hall cave with a truncated pyramidal ceiling whose center in bas relief is a design of four painted dragons (the central part is damaged) . The four slopes are covered with connected fountain patterns (those on the east slope are partially lost and those on the north and south slopes are blurred); and the west niche contains an eight-armed Avalokitesvara of the Qing dynasty. In the center of the south wall is a standing eleven-headed thousand-armed and thousand-eyed Avalokitesvara. Each of the upper corners is filled with an apsara. The east side of the central Avalokitesvara has an image of Indra above a seated deva and the opposite west side has a seated deva above Brahma. In the center of the north wall is a standing eleven-headed thousand-armed and thousand-eyed Avalokitesvara. The east side of the central image depicts Vasistha above the images of a three-headed and six-armed guarding warrior and pig-headed Vinayaka, and the opposite west side show Lakşmī above a three-headed eight-armed guarding warrior and Elephant-headed Vinayaka. Each of the upper corner is filled with an apsara. The space above the entrance displays five seated Buddhas. On the north side of the entrance wall is a scene of Avalokitesvara offering treasures to the poor, and on the south side of the entrance is a scene of Avalokitesvara with a bottle in hand giving water to the hungry ghosts. There is no corridor and front-chamber. On the space above the enatrance wall is a picture of five Buddhas sitting in Dhyana. The north side of the entrance wall is covered with the illustration of Avalokitesvara, from whose hands treasures like ivory and money flow on to the plate held by a poor boy below. The south side of the entrance wall depicts the illustration of Avalokitesvara pouring water down from his bottle into the mouth of a person (a hungry ghost) below. A eleven-headed, thousand-armed and thousand-eyed Avalokitesvara is in the center of the south wall. The heads are arranged into three rows, one above each other, respectively consisting of 3, 7 and 1 head from top down. A pair of hands clasps in front of the breast, a second pair is holding a treasured bowl below, a third pair is holding an incarnated Buddha over his head, and the other remaining hands hold nothing. The remaining small hands are arranged into four circles around the big hands. The two apsaras in the two upper corners hold offerings and kneel in the cloud. The east side of the south wall has an image of Indra above a deva and the opposite west side has an image of deva above Brahma. The west niche contains a eight-armed Avalokitesvara (renovated in the Qing dynasty) seated on a rockwork with a bow, a rule, an arrow, and rope in hands. The head is partly damaged. The ceiling center of the niche has a painted medallion surrounded, which is surrounded by the patterns of clouds, rectangular spirals, curving grass, and connected pearl borders on the four sides. The west wall has a picture of outlined in ink. Both the north and south walls have two bodhisattvas (the one on the south wall was taken away by American Langdon Warner). Each of the upper and lower sections of the south side out of the niche has a Bodhisattva wearing a hat. On the opposite north side are a bodhisattva wearing a hat in the upper section and a bodhisattva holding a water bottle below. There is an inscription which reads "By Shi Xiaoyu from Ganzhou." A standing eleven-headed thousand-armed and thousand eyed Avalokitesvara is painted in center of the north wall with the eleven heads arranged in three rows, the lowere row has one head and the the upper two rows containing five heads each. A pair of hands joins together in front of the chest, a second pair holds an incarnated Buddha over his head, a third pair holds willow branches and a bottle, and the other remaining hands are empty. These remaining small hands are arranged into four circles around the central big hands. The east side of the north wall is filled with a picture of Vasistha above a three-headed six-armed guarding warrior and pig-headed Vinayaka. The opposite side is filled with a picture of Lakşmī above a three-headed eight-armed guarding warrior and Vinayaka. The two upper corners each depicts an apsara holding a bud and flying down on a cloud.